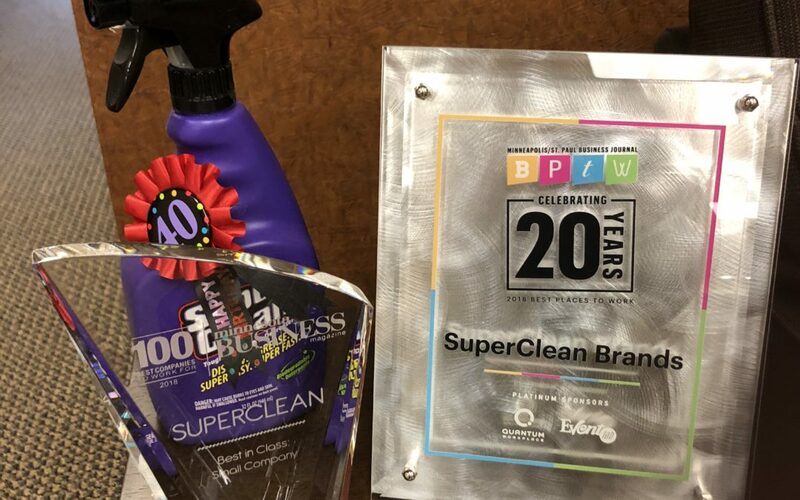 SuperClean Brands, LLC Continues to Win in 2018! Eagan, MN, August 17, 2018: SuperClean Brands, LLC received the honor of being named a Best Places to Work by the Minneapolis St. Paul Business Journal again in 2018. This comes on the heels of receiving the Best Companies to Work For award in the small business category by the Minnesota Business Journal in June. Super Clean has won both awards in the past but this marks the first time the company has received both awards in the same year. Since taking over the business in 2009 as President and CEO, Bryan Badzin, has worked diligently to boost the success of the Super Clean product line in parallel with creating a professional work environment that supports and nurtures the growth of Super Clean employees. The Super Clean professional environment includes providing clarity on what’s expected from employees, the tools and flexibility to get the job done well, while also making time for fun, comradery, and team building activities such as “drink cart”, regular coffee meetings, team events, and topping off the year with a first-class Christmas party. Employees are provided with regular lunches, chair massages, financial planning seminars, and flexible scheduling to holistically support employees in all aspects of their lives. Additionally, Super Clean believes in giving back to the community at-large with their “Super Clean Cares” program providing donations and service to a variety of local and national non-profit organizations, including those named by Super Clean employees, and providing paid time off to volunteer for the organizations they choose. “Super Clean is a place that people can make a difference in the business while growing personally and professionally because leadership makes it a priority to invest in them,” said Badzin. SuperClean Brands, LLC produces Super Clean Tough Task Cleaner-Degreasers designed to clean the toughest greasiest and grimiest messes super easy and super fast. Established 40 years ago, Super Clean has its roots in the automotive industry, but has expanded its reach to many other industries with a variety of applications including industrial, marine, farming, and general household cleaning. Super Clean products are biodegradable and phosphate-free to be easy on the environment yet tough on grease and grime. Super Clean is available at most automotive retail stores, Walmart, and online from Amazon. For more information about Super Clean, visit our website at www.superclean.com and connect with us on Facebook, Instagram and Twitter. Do you have an online sponsorship form to fill out for non profits? Hello Ryan, we are sorry but we don’t. To inquire about sponsorship, please contact our Marketing department at marketing@superclean.com. They will be able to assist you with your request. Thank you! Join the SuperClean Team to learn about upcoming super events and super deals.